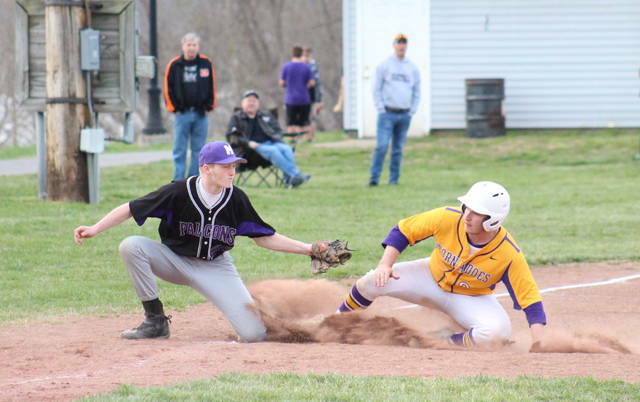 SHS senior Austin Baker crosses home plate, while Miller’s catcher waits on the the ball, during the Tornadoes’ 22-0 victory on Thursday in Racine, Ohio. RACINE, Ohio — They might not have scored early, but they did score often. 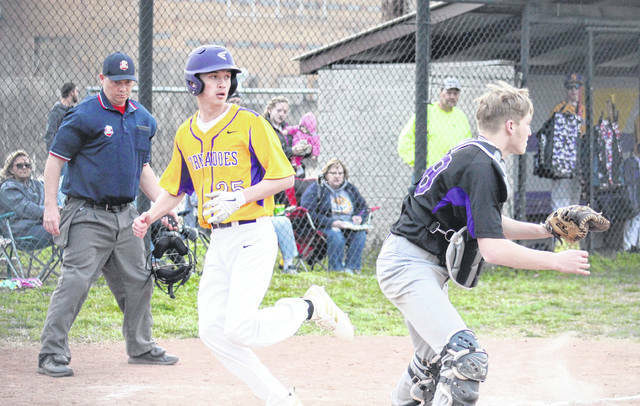 The Southern baseball team was held off the board in the first inning, but plated 22 runs over the next three frames, as the Purple and Gold breezed to a 22-0 victory over Tri-Valley Conference Hocking Division guest Miller on Thursday at Star Mill Park. Southern (4-2, 4-2 TVC Hocking) — which didn’t allow a Falcon beyond first base in the game — broke the scoreless tie with one out in the second inning, as Will Wickline singled home Coltin Parker. A two-out single by Gage Shuler brought two more runners home, and then a bases loaded walk gave the hosts a 4-0 edge by the end of the inning. The Tornadoes broke the game open in the third frame, sending a dozen batters to the plate and bringing eight around to score, making the margin 12-0. Southern combined six walks with five hits and came up with a 10-run fourth inning, capping off the 22-0 triumph. Parker earned the pitching victory in four innings on the mound for the hosts, allowing two hits, while striking out six batters. Ryan Laudermilt pitched the final frame for SHS, surrendering a hit and striking out two. Neither Tornado pitcher issued a walk. Shuler led Southern’s offense, going 3-for-4 with two runs scored and four runs batted in. Wickline was 2-for-3 with a double, three runs and two RBIs, while Parker went 2-for-2 with three runs and two RBIs. 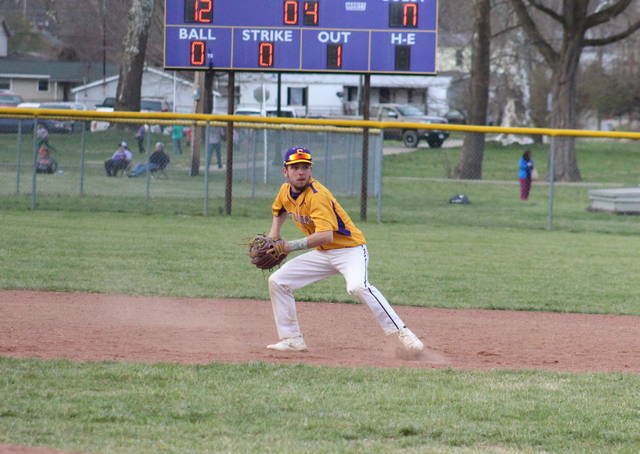 Cole Steele singled once, scored three times and drove in one run, while Austin Baker, Jensen Anderson and Billy Harmon each singled once and scored twice, with Anderson earning three RBIs and Baker claiming one. 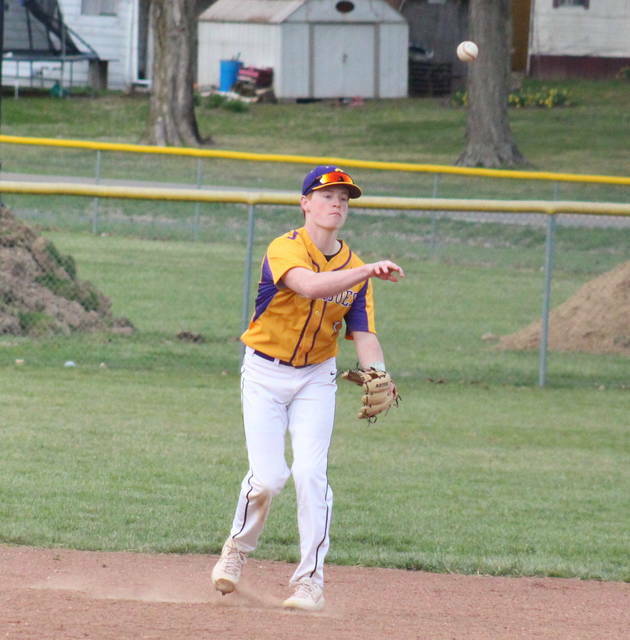 Noah Diddle contributed a single, a run and an RBI to the winning cause, while Ryan Acree, Logan Drummer and Joey Weaver each added a run and an RBI. Tanner Lisle, Jacob Milliron and Lance Stewart came up with an RBI apiece in the win, while Laudermilt crossed home plate once. Southern left seven runners on base, five more than Miller, but the Falcons were responsible for all-3 of the game’s errors. SHS and MHS are scheduled to meet again on April 22 in Perry County. After visiting Belpre on Friday, Southern will be back at home on Tuesday against archrival Eastern.